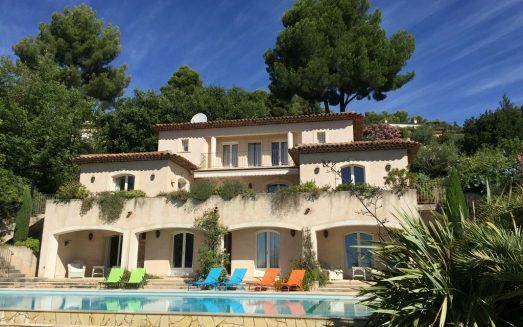 Villa Artisti is a luxury property located in the city of Cannes, in the heart of the French Cote d’Azur. The villa has been completely refurnished last year, but it has mantained the Belle Epoque style: it was built with this design in 1850 and now it mixes with contemporary elements. Antique furniture, refined modern materials create a perfect union of styles. High ceilings and stained glasses, fabulous staircases, marble fire place and parquets make this property a real dream. The property is composed of two apartments and an independent studio suite, located at garden level. A total of 5 double bedrooms, 2 pull out sofas, 4 full bathrooms, 2 living areas and 2 kitchens characterise this house. 500sqm garden with great sea view and a 1 car garage. The Apartment “Terrazza” expands on 70 sqm ground floor and includes one double bedroom with private dressing, bathroom, toilet, large living space , dining area and a fully furbished American kitchen overlooking a great terrace and the garden. The Apartment “Bellavista” expansa on 120 sqm on two floors, composed of 1 master room with private balcony and stunning sea view on the bay of Cannes, 2 bedrooms on the rooftop,with very comfortable beds, 2 large bathrooms (1 each floor) one with tub one with shower, a great living are and a contemporary fully equipped American kitchen. The Suite “Divina” is an independent location on the ground floor, including double bed and private bathroom on the ground floor with access to the large sea view garden of 500 sqm. The breathtaking view over the city and the sea make this luxury villa the perfect place to relax in complete comfort. Near the house there are shops for basic needs: you can find a bakery, supermarket, tabac, pharmacy and hairstylist.